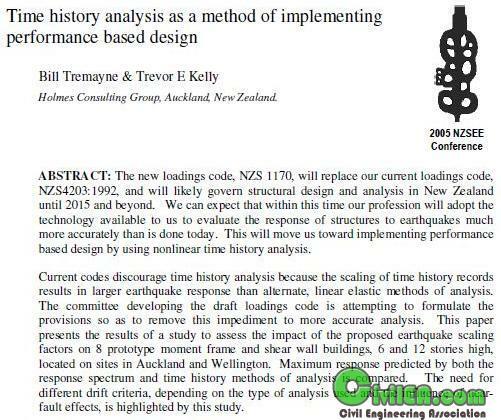 The current loadings code, NZS4203:1992 (Standards NZ, 1992) permits the use of time history analysis for all structures but the procedures are non-prescriptive and open to varying interpretation, particularly in the selection and scaling of time history records. Scaling of at least three records is required such that “over the period range of interest … the 5% damped spectrum of the earthquake record does not differ significantly from the design spectrum”. In practice, this has usually been interpreted so as to scale records to provide approximately the same average spectrum as the design spectrum. Shout: Do. Or do not. If any posted material in CivilEA is useful to you, please buy it. Support the authors/developers. By any means you may not use the posted material in CivilEA to make money! Use it only for evaluation! Just as a contribution to this (or any similar) post. It will give you all of the *.pdf documents that are stored on that site. In this particular example, there will be around 800 pdf papers.